Power generation and supply is one of the key indicator of economic prosperity for a country, Nigeria is the biggest economy in Africa, with a GDP valued at $376.284bn (2017). However, its power sector is performing below the level of its peer countries. Over half of the population (55%) has no access to grid-connected electricity and those who are connected to the grid suffer extensive power outages. To improve the power sector, the Nigerian government has undertaken long-term structural reforms (which started in 2005 but gained momentum in 2010) focused on privatizing legacy power assets and instituting regulatory reform. However, these reforms have proved insufficient and more must be done to address the challenges in the sector, which include sub- optimal utilization of generation plants (partly due to insufficient gas molecule availability), inadequate transmission infrastructure and high distribution losses (with related liquidity and viability issues). Nigeria has 12,522 Mega Watt of installed capacity, but due to maintenance, gas, water and transmission constraints, an average of only 3,879MW of capacity is operational (January to 15 August, 2015). The majority (85%) of installed capacity is fuelled by gas. Availability of gas molecules is low due to insufficient production, economic disincentives, inadequate infrastructure and frequent vandalism. The country’s transmission system has the capacity to transmit ~5,300MW but is disrupted by system collapses and frequent forced outages. Currently, transmission capacity is higher than operational generation capacity, but transmission will rapidly become a constraint due to increasing operational capacity. Although Nigeria’s distribution companies suffer significant losses, with ~46% of energy lost due through technical, commercial and collection issues. By the year 2020, it is Nigeria’s aim to generate an excess of 40,000MW with an energy mix that constitutes 69% thermal, 17% hydro, 10% coal, and about 4% renewable energy. Self-power generation costs >2x more than grid-based power, Nigerians get a significant portion of their electricity from private generators at a higher cost (NGN 62 – 94/kWh) than grid-based (NGN 26 – 38/kWh) power. Today, close to 95 million Nigerians are without access to electricity, they are made to face extensive power outages nationwide. Lagos State in its own have always prioritized the power sector with good plan and programs, most of this plan and execution is done through the Lagos State Electricity Board which seeks to establish in-state electric power stations, generate, transmit and, distribute electricity to areas not covered by the national grid system within Lagos and also facilitate Independent Power Projects and Public Lightings and more. In July 2017, Lagos State Government set a target for power generation through her Lago State Embedded Power Programme, towards generating 3,000 megawatts electricity for the State within the next three to five years. Energy represent a critical path in facility management and built environment capital expenditure globally, it is part of a reason while some have classified energy as a cost centre. Facility managers are facing increasing operational cost pressures and, as a result, everyone is looking to energy efficiency improvements as a methods to tackle this, although things have gone beyond using a simple energy-monitoring solution to achieve sufficient or in achieving significant cuts in consumption, now stakeholders are trying to unlock different models and arrangement or strategic power purchase methods that are becoming available to real estate key actors. 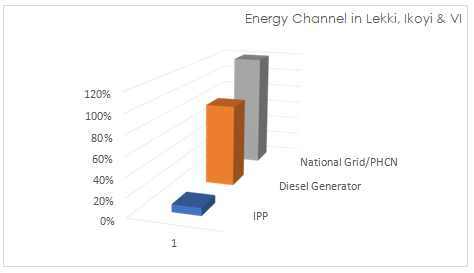 This report highlights different power channel and consumption pattern within Ikoyi, Lekki and Victoria Island. This is a snapshot of selected serviced/premium estates where there is a dedicated power generating plant that provide electricity to residents. The rate residents of these neighborhood pay for electricity is usually higher than the usual PHCN rates, these estates pay extra to the DISCOs to be placed on a special tariff structure whereby 80% supply is guaranteed at rate ranging between N55 – N85 per kilowatt hour is paid, compared to the regular N24-48/per kilowatt hour. Lekki upper and upper-middle class community, central businesses district and its environs have long taken diesel generators/diesel plants as her main source of energy, when PHCN goes off these residential estates and corporate infrastructures switches to their diesel generator seamlessly. These are number of estates with dedicated diesel power plants/generator, Independent Power Plant IPP/PPA Power Purchase Agreement and reliable electricity. A number of residentials and corporate real estate that are located in Ikoyi, Lekki and Victoria Island use Diesel Generator/Plant or in very few case IPP as the main source of energy daily and have since made the National Grid/PHCN an alternative channel. This is due to the long poor supply of power by PHCN and unstable current. Over 75% of these premium and standard residential estates have access to power between 20 and 24hours daily, mostly guaranteed by diesel generators and supplemented by PHCN supply while some others are placed on special DISCO’s tariff in other to enjoy at least 12hours supply of power which comes at an average of N45-75/Kilowatt hour, much higher than the normal tariff of N24-48/Kilowatt hour. Few residential estates have also implemented PPA/IPP for as their sole source of energy like French Colony, and there are those residential and corporate real estate infrastructures too that only run on diesel generators. There are a few housing estates along the Lekki Epe Express Way that are yet to connect to the national grid, so they make use of diesel generators. The most used power channel is the diesel generator followed by the national grid/PHCN while the IPP/PPA for private use unlike the ones built and connected to the national grid across the country, are yet to be tapped fully. Independent Power Plant IPP is arguably the most efficient and dependable channel in this axis, although it’s yet to be fully tapped or understood by various stakeholders and key actors in the real estate and built environment industry at large. Thus the need for more information and understanding of the PPA/IPP to enable it take it position in the boardroom (private and public sector) as an Off Grid energy solution for premium real estate that demands the best energy practices and delivery in Nigeria today. Figure 2 Ikoyi Residential Building Sample Q1 2018. 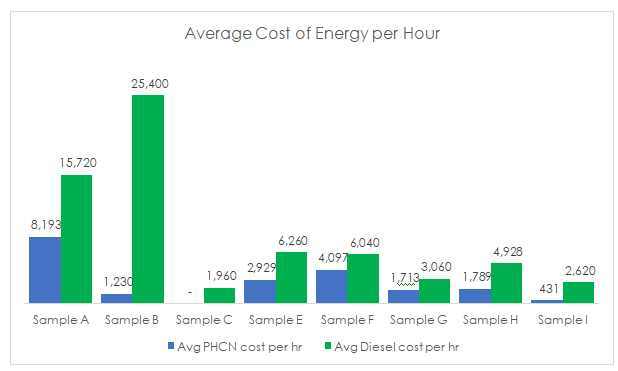 Average energy cost index above show that sample site like Sample C, Sample B, Sample I, Sample H located at Ikoyi West, Ikoyi South West have lower PHCN supply hours under the period in review as compared with their diesel consumption. Thus, areas with a lower PHCN indicate lower supply of power by EkoDisco to this location as compared with Sample F in the quarter under-review. 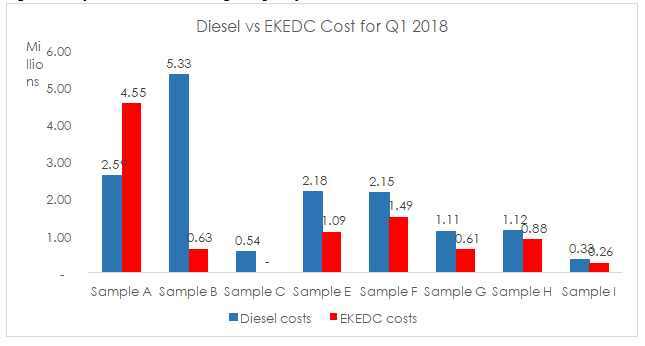 The above chart represents the cost difference across sample sites, Sample B and Sample A have the highest accrued Diesel cost respectively, Sample A has the highest EKEDC cost and Sample C has the lowest energy consumption cost overall with N334,050.00 & N255,079.65 for Diesel and EKEDC respectively. Average energy cost across all the site under-review is for this quarter is ? 1,008,490.80. Independent Power Plant providers in the market, although PPA unit cost is higher than other options. PPA unit cost between N100 – 140/kilowatt hour but it is a performance-based option that can serve as a sole source of energy within a large built environment. Distinction between a premium/standard real estate from the general type of estate is that in the former there are high level of household appliances that runs on power from lighting and heating to the kitchen appliances and other premium household utilities. From the comfort of having air conditioning system running, to the pumps running your water treatment plant and swimming pool, lift, sewage system pumps – all run on power. The role of power in running the facilities of a premium estate is vital. For the people who live in these estates or work in such a high-class corporate office, they need to have those things functioning properly, a stable power is required to drive them. For residents of premium apartments, the comfort and reliability of services is crucial – it is more important than the cost. While cost of providing comfort and reliability of services must be reasonable and justify the value provided, thus the need for continued search for answers for more efficient and performance-based options in the market. Novel IPP/PPA and alternative (energy) model that assures stability and cost-effective energy supply are emerging and it’s taking a part of facilities management discussions at boardroom and operational meetings across the various sector of the economy. Comprising over 1004 flats, maisonettes and studio apartments in the Victoria Island district, 1004 Estate is arguably the largest single luxury high rise estate in Sub-Saharan Africa at the moment. The estate is not connected to the PHCN grid but has a central power plant which serves the entire estate or residents’ power 24/7, the least sold energy units is N5000. On average residents or landlords between N40,000 to N60,000 units in a month, as this energy serves all residents appliances including cooking/kitchen equipment, the estate doesn’t allow cooking gas LPG liquified Petroleum Gas or other alternative cooking energy source other than the ones fixed already. PHCN power supply to Victoria Island had historically been poor, so it’s made a lot of economic and efficient sense to have a PPA structure within this environment to eliminate any energy constraints faced by most built environment in Victoria Island axis. 87% of the entire Lagos power market is served by PHCH DISCO’s (namely IKEDC & EKEDC), although their service is has been some levels improving after the sector was privatized in 2013 with new owners bringing in 24/7 customer service, routine and equipped support teams, and gradually improving in generation capacity, e.g Egbin Power Plant Lagos, Ikorodu was acquired at 1320MW capacity by her present owner and has been improved to 1,750MW, although gap remains wide from expected capacity the gradual deregulation of the power industry is birthing room for Independent Power Plant projects across the country a number of this Plants like Azure Edo IPP, Sagamu IPP, Akute IPP, Trans-Amadi IPP, Aba IPP though most of these IPP are connected to the national grid, there are a number of Off-grid IPP that serves estate and business districts running and some in the pipeline. Viathan Engineering and a number of other key actors like Clarks Energy and Proton Energy are driving IPP as better, efficient and stable energy channel. Estate Model: a group acquired land area, sold in unit to different Individual Landlords and property buyers that developed this with different infrastructure size, scope and taste. A residential housing estate Landlord Association and an Independent Power Plant provider had initiated a Power Purchase Agreement/IPP agreement, after a long effort of educating stakeholders and review of PPA benefit in the short and long-term. The Service Level Agreement includes a caveat that stipulated the least number of residents/landlords that must key in before project take-off fully, Diesel Power Plant, N100 per kilowatt hour, 24/7 Power Supply, Zero PHCN integration and The Independent Power Plant planned and presented a case to initial do a Pilot phase before fully kick starting the said project, this provider was given the go-ahead with a Pilot Phase of the work. Pilot phase of this PPA was set and running for 3month with zero PHCN, 24/7 power supply and maintenance of equipment with plans to increase the capacity. Its then appeared to the IPP provider that most of this residential estate are not willing to fulfil their obligations (pay for their monthly energy consumption unit), the firm then change payment model with an electronic units’ vouchers- which allows a consumer do “pay as u use”, nevertheless the project failed to take-off fully due to large overhead incurred from inefficient number of paying residents and huge number of residents that never key into the projects. IPP Project of any type should start with answering the question (1. Of household income? 2. Willingness & Ability to Pay? Energy consumption pattern?) of prospective target and environment, in-other to make a sound decision between go go or no no upfront (project -investment intelligence & business case). IPP proposition would gain more buy-in amidst the upper household class, at most an environment that has a mixture of the upper upper and upper middle, because this social class better understand the value and appreciate uninterrupted power supply 24/7 and are more than willing to pay for a stabled and efficient power supply. IPP projects established as part of the initial design of a highbrow residential built environment and positioned as sole source of energy that is paid for monthly or quarterly or yearly as the case may be or charged as part of the service for resident or Landlord would gain traction and sustainability.